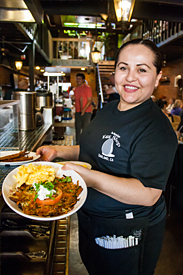 Located in the heart of Montclair Village in Oakland, CA, the Montclair Egg Shop offers quality food and great service in a convenient location. Check out our menus, read our story, or just come by! The Montclair Egg Shop opened in 1974, the fifth in a dynasty of seven egg shops throughout Oakland and Berkeley, and now remains the last one standing, the signature egg shop masterminded by Ed Baker, who’s never had a cup of coffee in his life.